100 percent custom build 25′ competition. Started with moving the consol and 65 gallon livewell/rocket launcher forward 18′ to gain a much larger cockpit. Made the transome a killbox/bait cooler witch drains overboard aft. Made the consol narrow to give plenty of walk space as well recessing a pair of 10′ subs in consol. 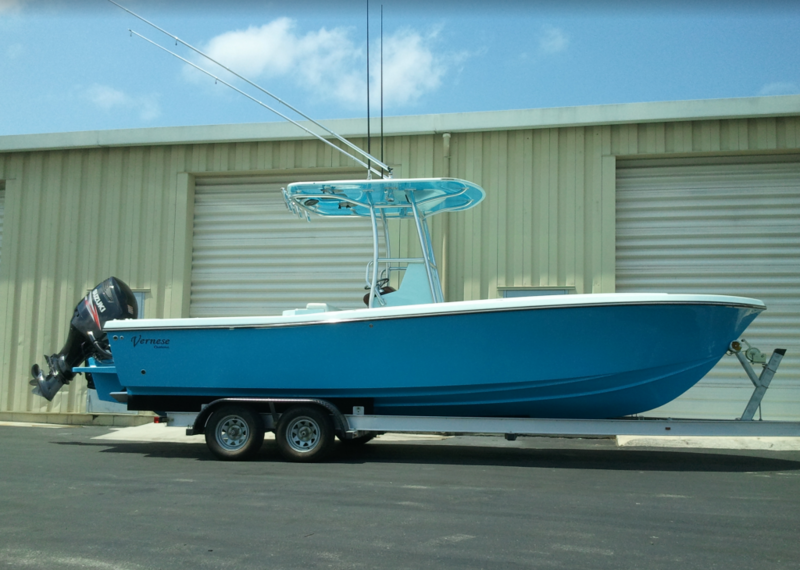 The hardtop is threw bolted into the forward stringers, also has recessed pancake teaser reels, life jacket storage, pair or 6.6 speakers and LED spreader lights. Salt water plus 25 gallons freshwater washdown. Custom reclined seating across the aft kill box. The forward bulkhead for the storage in the floor was moved aft to gain 6ft of storage blow the floor. The boat is all Enron painted inside and out. The 300 Suzuki has 900hrs on it.